Cornfield Maze - Find your way through the paths cut in the corn. Try to find all 12 stations and stamp your maze card as you go. Learn about farming - Answer farm questions placed at each station in the maze & check your answers at the concession building. Flashlight Nights - Find your way through the maze in the dark with a flashlight. Bring your own flashlight or rent one from us. Kiddie Maze - Cornfield maze for small children (find the different farm animal stations & color your card as you find them. Pumpkin Painting - Paint your own pumpkin. Fun group activity and we furnish the paints! Pumpkin Ring Toss - Try your luck at winning a pumpkin! Water Baloon Launch - Try hitting a target placed in the field. Corn Shelling - Take a turn shelling corn on our antique corn sheller. Maize Time Mural - Stand behind the cutouts & take your picture. Picnic Area - Groups may bring their own lunch and eat it at the Maze. Hayride - Learn about agriculture on your ride around the farm. 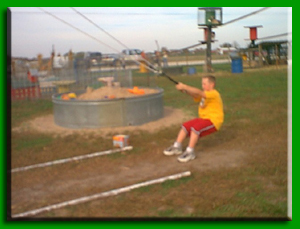 (Available for groups of 15 or more with a reservation, (or) a $30.00 minimum per hayride for groups less than 15.